Assessment procedures for infants, toddlers, and preschoolers should include caregiver interviews, caregiver-report questionnaires, observational coding procedures, and collateral reports (i.e., medical, child care, etc.). This multimodal assessment approach provides clinicians a systematic means to incorporate the many factors that impact an infant’s clinical presentation. 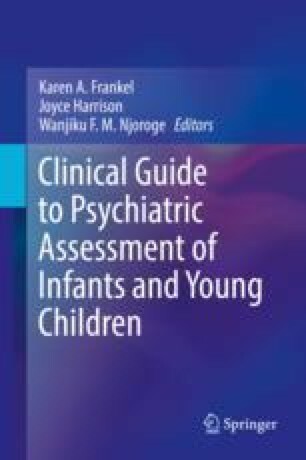 The prior chapter focuses on one aspect of a multimodal psychiatric evaluation, specifically observing the dyadic interaction. In this chapter, we outline key considerations regarding instrument selection, application and interpretation, and provide an in-depth list of dyadic observational measures which have been found to have useful clinical applications.